This recording is predominantly shaped by four organ concertos from Handel’s London years and is complemented by an overture from an oratorio which relates directly to the development of the organ concertos. The Overture to Deborah appears in the original orchestral scoring. A movement of another oratorio’s overture is included in one of the organ concertos in the demonstrably extraordinarily popular, contemporary arrangement for a keyboard instrument. 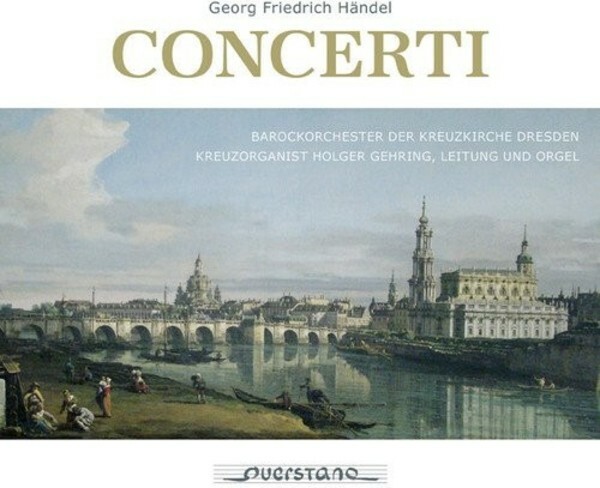 Conducted by Dresden’s Kreuzorganist (organist at the Church of the Holy Cross) Holger Gehring, experienced musicians have united to play these works in a way similar to the original. This recording is based on extensive investigation which reconstructs both the original ornamentation used and choice of tempo and the original mood. It is demonstrably not enough to just play the notated sheet music, rather it needs embellishment with abundant ornamentations. For some works or individual movements, there are contemporary ornamentations, others have been similarly supplemented. Other sources such as the contemporary keyboard scores by William Babell likewise substantiate this practice. Timing instructions, authentic tempo measurements from dance movements from the 18th century and much more form the basis for the choice of tempo. The so-called “Liegende Orgel” [horizontal organ] at the Dresden Kreuzkirche is used in this recording. This also matches the historical performance situation, in which the composer himself likewise conducted the orchestra as the soloist from an organ with horizontal pipes. All this allows us to get a very interesting insight in Handel’s London work.